Wow, this one's a total sleeper, and arguably the best film playing right now. 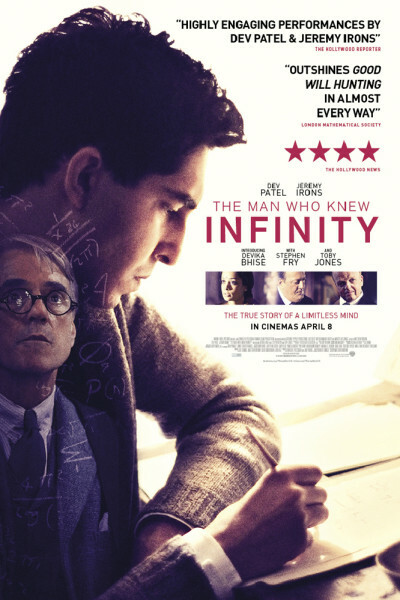 I enjoyed the heck out of it, and wept at Ramanujan's unknown and bridled-by-convention genius, however contrived or manipulated or fictionalized or exaggerated or overly dramatized it may have been. It's Rocky for math nerds, and darn compelling. Bring it! And Jeremy Irons' "fellowship" speech is beautiful. I'm tempted to paste it here, but prefer to let it linger in my mind for you to discover on your own. You'll be glad you did. Man, I barely even heard about this movie, and boy, am I glad I found it! A UK import, it's very Chariots of Fire meets My Brilliant Career meets Paper Chase meets A Beautiful Mind meets The Imitation Game meets The Theory of Everything meets Downton Abbey. And if that doesn't get you there, nothing will. Is it a 9 or a 10? Nope. Will anyone be up for an Oscar? Nope. But is it worth a couple hours, and surely at the top of May's heap? You bet your bottom dollar. You'll see the clock's mechanisms working from a mile away, and love every freakin' tick of 'em.